For Powerball-Winning Family: A Trip To The Beach And Maybe A Horse : The Two-Way Each of the two winning tickets is worth about $192.5 million if the "cash option" is chosen. One was sold in Missouri, the other in Arizona. The Missouri family that bought one of the winners has some plans for the windfall. 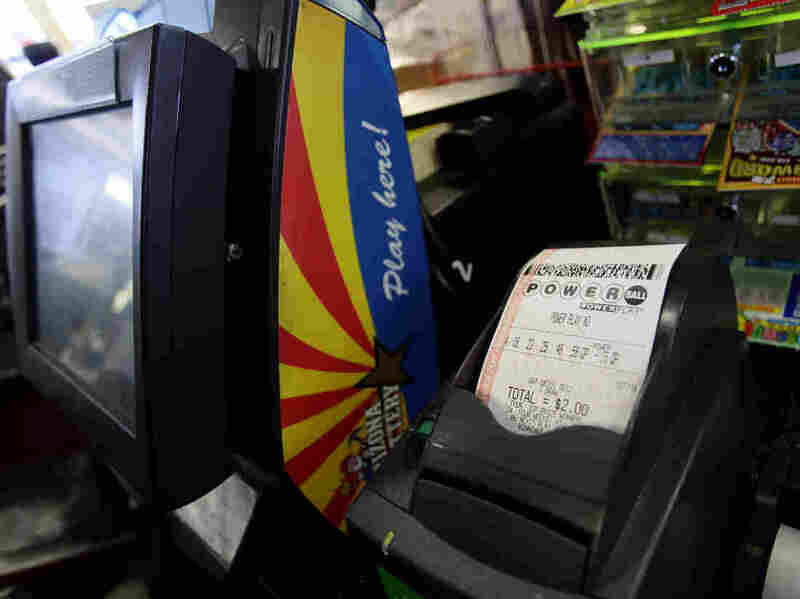 A Powerball lottery ticket sits in the machine at the 4 Sons Food Store and Chevron gas station which sold one of two winning Powerball lottery tickets in Fountain Hills, Ariz. The Missouri Lottery confirmed at mid-day the reports that the Hill family had one of the big tickets. The other was sold in Arizona and the buyer has not yet been identified (see below, though, for news about a possible sighting of that lucky person). "The couple, who adopted a daughter from China five years ago, said they talked about adopting again since finding out about their win. They also plan to help family members, such as paying for college educations for their four granddaughters and their four nieces and nephews. "Cindy also said Mark, 52, has talked about a red Camaro.
" 'It's really going to be nice to spend time – not have to work – and be able to take trips with our family,' she added." The lottery adds that "Cindy Hill worked as an office manager, but was laid off in June 2010 due to the loss of a grant. She said she then took a year off to spend time with their daughter and began looking for work recently when her daughter went to first grade. Mark Hill works as a mechanic for Hillshire Brands." There's a noon ET news conference in Dearborn, Mo., at which Missouri Lottery officials are expected to announce who bought one of the two big winning tickets in Wednesday night's Powerball drawing. There was about $587 million in the jackpot. Each of the winning tickets is worth about $192.5 million (before taxes) if the winner takes the "cash option." As The Kansas City Star writes, "according to media reports and people in the community, the man who bought the winning ticket was 52-year-old Mark Hill of Dearborn." One of the winning tickets was bought in Dearborn. ABC News says that Hill "updated his Facebook account late Thursday, writing, 'We are truly blessed, we are lucky winners of the Powerball.' Within hours, his family began celebrating, telling ABC News Hill is one of the two big winners. 'Just shocked. I mean, I thought we were all going to have heart attacks,' Hill's mother, Shirley, said Thursday." She told ABC that her son "works in a hot dog and deli packaging factory." The other winning ticket was bought in Fountain Hills, Ariz. But as KPHO-TV in Phoenix reports, "a surveillance video from an Upper Marlboro, Md., convenience store shows a man in a yellow construction or highway worker jumpsuit celebrating what witnesses said were the winning numbers for Wednesday's Powerball drawing. The man reportedly bought the winning ticket in Fountain Hills while visiting Arizona." "Larry Chandler of Highland, Ind., didn't grab the monster prize in Wednesday's record Powerball lottery drawing, but he's feeling thankful just the same. Chandler won $1 million of the massive jackpot, NBC Chicago reports. ... Before the win, Chandler was facing foreclosure on his home. Now, the electrician plans to start a college fund for his daughter, give some money to his mom and dine with his girlfriend at Red Lobster, the station said."